Anna’s Pizzeria is a busy, family-friendly restaurant serving up authentic New York style pizzas and Italian dishes. There are currently two North Carolina restaurants – Apex and Fuquay-Varina – both located in charming, historic downtown locations. Our full-service menu offers a wide range of choices sure to please everyone. Whether you are in the mood for a brick oven pizza, classic Italian dish like Chicken Parmigiana or one of our specialty pastas like Penne ala Anna’s, you can always count on a delicious meal that’s made-to-order using only the freshest ingredients. To complement your meal, we also offer a variety of wine and beer options including several seasonal beverages. For special events and large parties, The Loft is a Private Dining Room upstairs in Apex, NC that can accommodate up to 60 people. It’s the perfect location to host a business meeting, special party or small wedding reception. 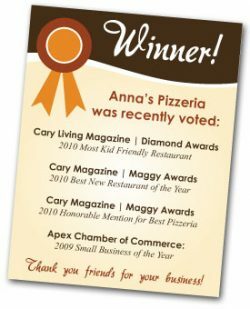 At Anna’s Pizzeria, we take pride in delivering a fun, upbeat dining experience filled with great food, beverages and attentive, friendly service. We invite you to explore our menu and come be our special guest for your next family meal.